Haroon Moghul adresses crowd during annual Eid Al-Adha celebration. The Muslim Student Association (MSA), held a celebration for Eid Al-Adha, or the Feast of Sacrifice, in Chapin Auditorium at 6 p.m. on Friday, Sept. 15. MSA prepared a dinner along with a talk from guest speaker Haroon Moghul, about his book “How to Be a Muslim: An American Story.” The organization also hosted a post-Eid celebration social in the New York Room at 8 p.m., which included music, henna and games as a way to reconnect, as well as form new connections with members of the community. 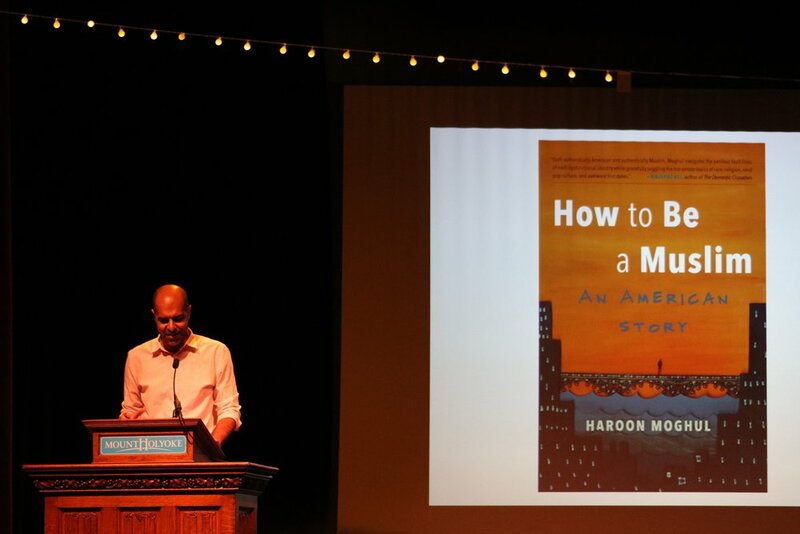 Haroon Moghol speaks on the Muslim-American experience in the Chapin Auditorium at Mount Holyoke College. Eid Al-Adha is one of the two most important annual Islamic holidays. The event itself symbolizes a willingness to make sacrifices to remain on the path of Allah. The celebration is called the Feast of Sacrifice because Muslims are commemorating Abraham, who was so loyal he was prepared to sacrifice his only son when Allah asked him to. At the last moment, however, Allah revealed the sacrifice was already fulfilled because Abraham’s love for Allah was greater than anything else. 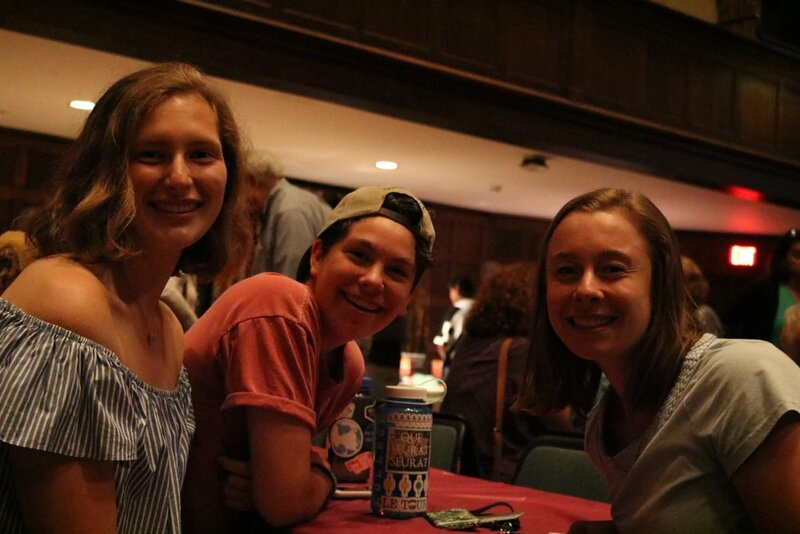 Emma Taylor ’20, Mira Rosenkotz ’20, and Sarah Ratzlaff ’20 smiling before the start of the Eid celebration. The Feast of Sacrifice always follows the annual Haji, or pilgrimage to Mecca, which — according to Al-Jazeera — begins every year on the eighth day of the Dhu al-Hijjah lunar month. It is one of the five pillars of Islam: to complete a Haji in order to showsacrifice to Allah. Eid Al-Adha is celebrated globally, including by Muslims who do not complete the Haji that particular year, making the celebration one of the largest in the Muslim world. This year, Eid Al-Adha was celebrated on Sept. 1, which was the move-in day for Mount Holyoke first years. At that point, many students employees had also moved onto campus. Since many Muslims in the MHC community could not celebrate Eid Al-Adha with their families and friends, the MSA wanted to make sure members of the community could still take part in such an important tradition. “We feel it is important to create spaces where people can express their religious identities and feel acceptedit was crucial for us as the MSA to create a space on campus where we recognized this holy event,” stated the MSA Board. MSA Advisor Elizabeth Lozovaya began the Eid Festival by welcoming audience members to the celebration. 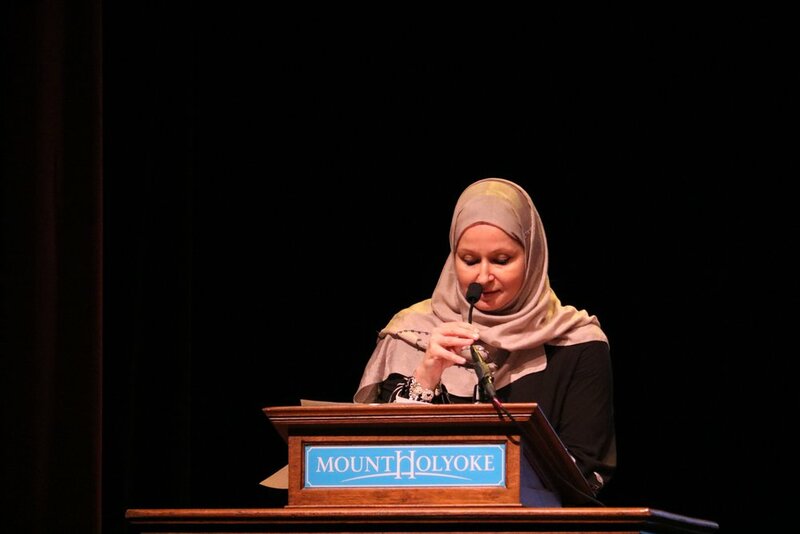 The MSA board noted that theMuslim community at Mount Holyoke is “complex and multidimensional, intersecting across many different communities on campus.” In celebrating the Feast of Sacrifices they tried to bring together a Muslim community with the shared experience of living in America. “Haroon Moghul is an important voice in the Muslim-American diaspora. His work speaks to many people of vast experiences, yet captures the authentic nuances of being Muslim in the West,” MSA Board said of the speaker. Ali Aslam, professor of politics and member of the Muslim community on campus, felt Moghul — as well as other speakers the MSA has welcomed inpast Eid celebrations — highlighted the importance of being unique yet ordinary. The word Eid itselftranslates to “feast” or “festival,” -and the traditional greeting during Eid Al-Adha is Eid Mubarak, which means ‘blessed festival.’ The MSA’s celebration of the holy tradition was a way for the Muslim community to have a blessed, or happy, Eid together.